The season of endings grows darker, as civilisation fades into the long cold night. Essun—once Damaya, once Syenite, now avenger—has found shelter, but not her daughter. Instead there is Alabaster Tenring, destroyer of the world, with a request. But if Essun does what he asks, it would seal the fate of the Stillness forever. Far away, her daughter Nassun is growing in power—and her choices will break the world. Middle volume syndrome sets in in the surprisingly circumspect sequel to one of the best and bravest books of 2015. 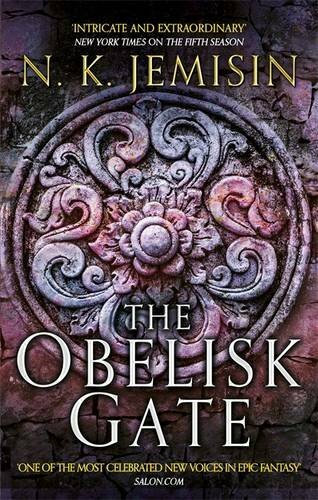 Though the world remains remarkable, and the characters at the heart of the narrative are as rich and resonant as ever, The Obelisk Gate sacrifices The Fifth Season's substance and sense of momentum for a far slighter and slower story. In the Stillness, a perpetually apocalyptic landscape which may or may not be our planet many generations hence, purpose is a pre-requisite. A use-caste, it's called. There are strongbacks and breeders and cutters and hunters, to name just a few, all of whom are defined by what they do; by what they can contribute to the communities, or comms, that they call home. This is a hard world, however, replete with hard people. Season after Season—of widespread death by choking, boiling and breathlessness among other, equally unpleasant ends—has seen to that, so no comm will carry you if you're not prepared to pull your weight in some way. In the Stillness, there's just no place for waste. No place for orogenes like our heroes, either. Able as they are to manipulate thermal and kinetic energy, orogenes, or roggas, have huge power, and with it, responsibility. That they could choose to behave irresponsibly, or behave in that fashion by accident, represents a risk most of the men and women of this world aren't willing to take. To wit, orogenes are either slaughtered as soon as they start exhibiting abilities, or sent to the Fulcrum, to be trained; some might say tamed. Dear little Damaya, The Fifth Season's first perspective, was one such soul, summarily taken from her parents simply because she was different. At the Fulcrum, she was shaped—through pain and the promise of gain—into Syenite, said text's second perspective, but when, years later, she discovered the depths of the depravity underpinning this facility, she escaped, and again changed her name. As Essun, the third of The Fifth Season's three POVs, she met a man and had a family, all while hiding what she was, as well as what her children were... just as N. K. Jemisin hid the fact that her novel's seemingly separate narrators were one and the same. That discovery packed a proper punch, but it's a known quantity now—as indeed is Essun's deception. After outing her as an orogene, her hateful husband Jija coldly killed their infant son for it, before running off with their adolescent daughter. Essun spent the bulk of The Fifth Season trying, and failing, to find them. In The Obelisk Gate, readers, at least, learn where they went, and why: to a comm called Found Moon, in the hopes of curing Nassun's own inherited orogeny. Nassun herself isn't entirely convinced of this, but she'll do almost anything to keep her daddy happy—not least because when her daddy gets angry, his murderous rage takes centre stage. So Nassun knuckles down and does her level best to be something she isn't; anything other than what she is. Little does she know, initially, that the so-called Guardian who takes her into his tutelage—a familiar face from the Fulcrum—may be making her into a monster. Whereas The Fifth Season was an incredibly kinetic novel, with lots of moving parts and not a little mechanical magic greasing its wheels, The Obelisk Gate, in stark contrast, stands still. Most of it takes place in the claustrophobic, crystalline caverns of Castrima, and although that could be fascinating, I'm afraid little of note happens there that couldn't have occurred anywhere. A good portion of the book is given over to "ridiculous, mundane, incredibly tedious stuff," (p.128) as above, and although Essun comes to love its like, I don't know that I ever did. What with the terrible tension between Nassun and her father, Nassun's chapters are markedly more engrossing than her mother's, and they successfully develop both her and her morally mysterious teacher into more complete and conflicted characters than the plot points they played in book the first of The Broken Earth. Sadly, these sections are few and far between, and Essun's far larger share of the story only really gets going when the comm she's been assimilated into comes under threat. "There is a catalyst alive in Castrima now, accelerating unseen chemical reactions, facilitating unexpected outcomes," (p.286) notes the narrator, and not before time. But this is left to the last act, and in the interim... you can really feel the wheels of Jemisin's trilogy spin. The Obelisk Gate is small and safe where The Fifth Season was large and surprising, static where said was speedy; and although it builds out the world and its workings well, and establishes Nassun as a character no less complex by the end than Essun, it's a shame all the same that such a stunning start should be succeeded by such a sedentary, albeit completely readable sequel. Thanks for the interesting review Niall. It sounds almost disappointing after the wonderful Fifth Season which i keep recommending (and now of course has it's Hugo). I shall nonetheless read this and hope that now Ms Jemisin can devote herself to writing she can pull the whole together. Meanwhile my kindle now has The Obelisk Gate as I pre-ordered it without any second thoughts a while ago.